The Cyberjaya Premier Property showcase is back with wider and better choices! Due to the overwhelming response and success of the showcase last year, the organizers of the Cyberjaya Premier Property Showcase have decided to hold the second instalment to cater to potential property owners and investors wanting to own a property within an exclusive postcode of Cyberjaya’s intelligent city. 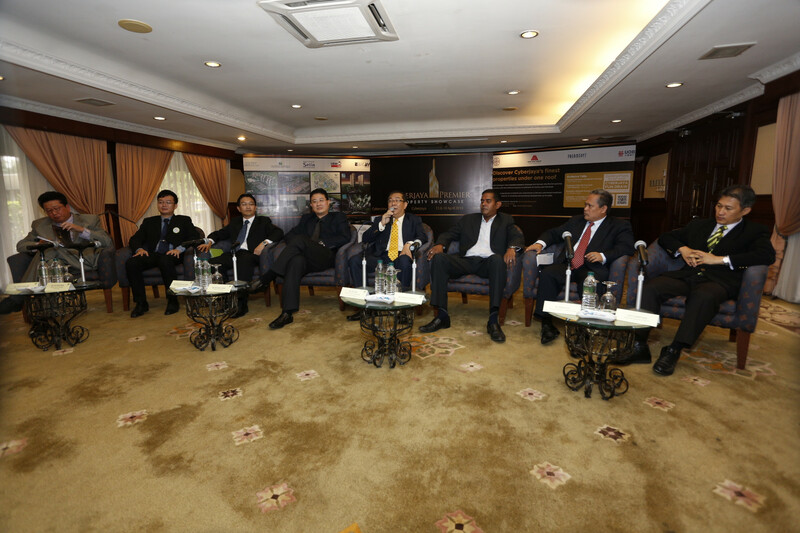 This year, the showcase is jointly organised by eight renowned property developers such as Setia Haruman, Mah Sing, MCT Consortium, SP Setia, UEM Land, Emkay Group, Paramount Property and Glomac and will take place on 13 and 14 April 2013 at Cyberview Resort and Spa. “I am proud to share that with the support and collaboration from all the developers present today who together will be launching properties worth about RM5.76 billion in Gross Development Value for this year, we are confident that upon completion, this will elevate Cyberjaya to the next level, as a self sustaining and flourishing smart city, where we anticipate the current population to reach 100,000 people by end of 2016.” said Mr YK Liew, Head of Sales & Marketing, Setia Haruman Sdn Bhd. The two-day event led by Setia Haruman is the direct result of the growing demand and interest for residential units,sohos, apartments and retail shops / offices within this fast-growing city. The public will be given a special viewing of 21 show units open during this premier property showcase and will witness for themselves why this is the preferred place to live, study, work and play. The Cyberjaya Premier Property Showcase is a golden opportunity to secure one’s dream home or lucrative commercial investment with a great selection of choice residential and commercial developments. “We wish to thank the Developers present today –Mah Sing; UEM Land; SP Setia; MCT Consortium; EMKAY; Paramount Property and Glomac – for their endless pursuit in making Cyberjaya what it is today and what it shall become in the future, a green city with a balance ecosystem.” added Mr YK Liew. With Cyberjaya emerging as the city that offers a holistic experience for everyone, the property developers are convinced that potential buyers and investor would grab the opportunity to come and check out the properties and the event itself. Furthermore, the various properties built within the serene and picturesque city provides an excellent value for money to individuals who are seeking to be a part of the respectable and exclusive Cyberjaya community. The property showcase is aimed at familiarising visitors with the city and to witness the city’s significant growth over the years, therefore visitors can join the interesting guided tours conducted hourly. Representatives from the above-mentioned developers will be on-board to help assist visitors analyse and compare available options. To further cater to public interest and convenience, UOB – the sponsor and financier partner for the showcase will be offering various end-financing options to interested consumers during the event. There will also be a series of exclusive property and health related talks during the showcase which includes Dato Danny Goh, (Executive Director of MCT), Albert Ee, (Feng Shui Destiny Consultant) and Dr. Rajbans Singh (Health and Wellness Consultant). The property showcase will also cater to families and children with fun filled activities, entertainment and fun draws giving out fabulous prizes such as Samsung Galaxy Note II, Samsung Galaxy Camera and Samsung Galaxy Tab 2 10.1 to ensure a wholesome and memorable outing for all.